I will make every possible effort to respond within 24 hours. ♥ Bringing your first bunny home? What do you need? ♥ How do you Rabbit proof your house? Bringing your first bunny home? What do you need? First, you will need a hutch for your bunny. It should be about 4 times the size of your bunny so he or she can stand up straight on their hind legs. It should be wide enough for them to be able to make a couple of hops from front to back and side to side. If you will not be able to let your bunny run for a few hours every day, the hutch should be even bigger to enable them to exercise. You could provide your bunny with a smaller hutch, but in doing so, you will need to dramatically increase their exercise time outside of the hutch. Exercise is not only important to the mental health of your bunny, but movement also helps keep their intestines flowing correctly to prevent gastric stasis (decrease of motility in the gastrointestinal (GI) tract which can be fatal). One suggestion would be to look into the different sized fully enclosed wire dog kennels. These would provide your bunny with plenty of room front to back, side to side, and top to bottom. You will need to make a better floor for your bunny though because the wire on the bottom of dog kennels are made fairly large and are best for "dog" feet not bunny feet. Wire floors are not good. 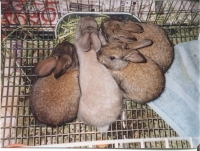 Bunnies do not have pads on the bottoms of their feet, and wire floors are not only uncomfortable, but they could also cause "hock sores" (sores on the bottom of the back feet). Several places sell interlocking plastic floors that you could fit into the bottom of your hutch. These plastic floors allow waste to fall through, keeping your bunny's feet clean and dry. Bunnies also like to hop on top of things and hide in things. 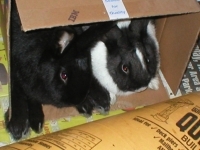 You could provide your bunny with a sturdy box with one side open. He or she can then hop on top or crawl into it. Make sure it can support the weight of your bunny. You would not want it to collapse when jumped on. Also make sure you have several spares, because your bunny will chew it apart. At the rabbit rescue, we fashioned shelves out of wood that we fastened half way between the floor and the roof of the hutches that are big enough for the bunnies to lie down on and spread out in a relaxed position. Provide your bunny with either a hanging water bottle or bowl for water. If you use a bowl, find one that can be fastened to the side of the hutch or you will have lots of spilled water. Your bunny is not beyond flipping and tossing a water bowl if it is not secured. Keep these items clean and free from sediment so that your bunny has fresh clean water 24 hours a day. 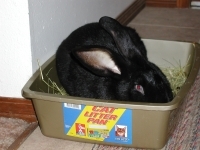 Your bunny can also be taught to use a litter box. Most bunnies use the same spot in their hutch to urinate. Once you find their favorite potty place, put a litter box there with straw or hay. You will find your bunny takes to using it rather quickly. You may want to fasten it to the side of the hutch, because your bunny will also love to flip it and shove it around. Bunnies are very playful and a litter box makes just as much of a good toy as anything. You will also notice that your bunny will chew on anything you use for litter in the litter box, so do not use cat litter, pine or oak shavings, or anything that could be harmful for your bunny. Hay and straw is ok, but replace it often and keep it fresh. Now that we have all the essentials, where should you keep your hutch? Some people keep their rabbit hutches outside. But, keep in mind that being the lowest animal on the food chain, there are many predators out to catch rabbits. Neighborhood cats, dogs, and even predatory birds. Even though these predators cannot get into your rabbits hutch, just prowling around the outside of the hutch can cause your rabbit enough stress to give it a heart attack. So, if you intend to keep your rabbit outside, make sure it is in an area that cannot be accessed by predators. 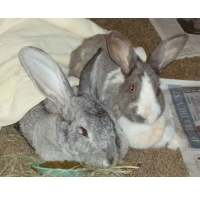 It is best to keep the hutch indoors where temperatures remain below 75 degrees? Constant temperatures over 75 degrees could cause heat stress. It should not be kept in a place that becomes so cold that their water freezes (low temperatures of about 40 degrees are ok). Your bunny can stand low temperatures but do not allow their water to freeze? Keep them out of drafts and in a place with minimal dust and dander as bunnies are susceptible to upper respiratory problems that cause coughing, sneezing and trouble breathing? How do you Rabbit proof your house? 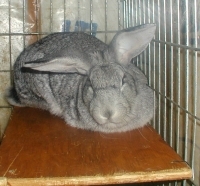 You will need to exercise your rabbit at least 2 to 3 hours per day according to Dr. Lee Meyer at allexperts.com. This is not only to keep them from being overweight, but it also improves their mental health. Rabbits are naturally curious creatures. They love to run, dig, and kick up their heels. Your indoor exercise area should be free of electrical cords. Bunnies will chew, and an electrical cord is very enticing to them. During exercise time, you can unplug your cords and put them up high, or you can get special flexible wire coverings to put around your cords so they cannot chew them. They will also chew on furniture legs, chair coverings, plants, plant pots, and just about anything they can get their teeth on. Remove pillows that you do not want destroyed and cover furniture legs with cardboard. Keep all indoor plants high enough so that your bunny cannot reach them. Many popular house plants are toxic to your bunny. You can check out the safe and toxic fruits, vegetables, and plants here on Diana' Rabbit Rescue. Rabbits also like to dig. They will dig and chew on carpet, through the carpet padding and down to the floor. Make sure if your bunny' exercise room has carpet, it is not carpet that you value. They will also pull threads out of carpet which can cause blockage in their tummies, so, make sure the carpet is a low pile carpet. You could also cover the carpet with a layer of cardboard. To satisfy their desire to dig, you can provide them with newspapers which they will dig, shred, and completely destroy, but they will have loads of fun doing it. You can provide them with a play room with wood or tile floors, but they will slide around on the floor and will have poor traction. This could cause some bunnies to be afraid of moving, and thus not get the exercise they need. Bunnies can jump as well. Some rabbits will jump onto chairs, low tables, into large plant pots, and more. Here at the Rabbit Rescue, we had a very small bunny jump up onto a dining room table. If you have special knick-knacks on tables around the room, make sure they are up high so they do not get knocked over and broken. Bunnies are burrowers. They love to go in and under things such as hutches, beds, and chairs. If you have these types of furniture in your rabbit's playroom, make sure they are high enough so you can reach your bunny if necessary, and be aware that once under something like a bed, they may try to chew their way into the mattress from underneath to make a hiding place. You can cover the openings under furniture with cardboard or wood to keep them from getting underneath. Provide your bunny with boxes to hide in, or round cement tube forms work well to give your rabbit a "rabbit hole" to play in. Rabbits will explore as much as they can, so make sure any exits from the room are blocked so they cannot wander around your home. You can use cardboard or child gates. If using a child gate, make sure the openings in the gate are small enough so your bunny cannot stick their head into the spaces. They will try and you don’t want them to get trapped. Make sure you provide a litter box, food and water for them during play time. The best setup would be to bring their hutch into the playroom and secure the door in an open position so that bunny can go in and out of the hutch at will. If you cannot bring the hutch into the exercise room, you could provide a pet carrier with food, water and litter box. Most of all, supervise your bunny at all times. Like a small child, they will get into anything and everything, given the chance. Bunnies love to chew. They will chew on just about anything. They also like to throw things, flip things, and shove things around, thus the need to fasten food dishes, water dishes, and potty trays to the side of the hutch. But, when you do that, you need to provide your bunny with something else to do since they cannot flip, toss, or shove these items anymore. 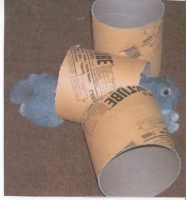 You can start with simple inexpensive toys such as paper towel rolls, empty toilet paper rolls, and small boxes. When providing toys for your bunny, make sure they have as little artificial color and ink as possible as your bunny will chew them up and swallow pieces. When giving boxes, use brown non-colored boxes and try to stay away from boxes with too much tape. Using a paper tape to hold your box together is a good idea. Make sure you have a lot of them available because the boxes and paper towel rolls will be chewed to pieces in no time, but your rabbit will have loads of fun doing it. If the boxes are sturdy enough, your furry friend can hop on top and use it as a perch also. You can also use small single serve plastic water bottles but remove the labels and glue before giving to your bunny. Try using a small wire or chain to hang the bottles from the top of the hutch providing a free moving toy for them to play with but make sure there are no sharp ends that could poke your bunny when using wire. Small plum branches make good chew toys and help your bunny keep their teeth worn down properly. Stay away from cherry branches. They are toxic to your rabbit. A piece of a round cement form tube can provide your rabbit with a nice "bunny hole" to run through, hide in, jump over, and roll around. They will also tear it to pieces eventually, but they will have lots of fun doing so. These store bought toys create some entertainment for the rabbits in the rabbit rescue. This wood hanging toy is sold in the bird aisle at pet stores. It contains natural wood (no cherry wood), no artificial coloring, and a little bell at the bottom for bunny to bat at. This hanging toy (also a bird toy) contains hard plastic beads that your rabbit cannot break with their teeth. It provides several moving pieces to entertain your bunny. This is a "cat ball" actually found for sale at a local rabbit show. Since bunnies love pushing and flipping things, this ball can provide mounds of entertainment. It is made of a nice hard plastic and does not provide a place for bunny to get a good grip in order to tear it apart. 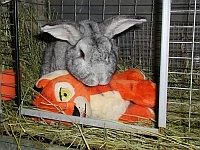 Stuffed toys could provide companionship for some bunnies. But, before you make a stuffed toy a permanent fixture in your rabbit' hutch, supervise very carefully. If your bunny chews off noses and eyes, or makes holes and pulls out the stuffing, a stuffed toy will not be appropriate for your rabbit. The rabbit rescue had a rabbit (Mr. Whitehead) who developed a licking problem. He licked his hips and hind legs so much that he licked his hind quarters bare. He was put through a battery of tests to try to determine why he suddenly started licking so frantically. All of the tests proved negative. We tried moving him to other parts of the bunny room and putting him next to various other bunnies to see if he would calm down, but to no avail. One day, the we noticed a stuffed, short hair "tigger" toy at a garage sale. Shortly after presenting "tigger" to Mr. Whitehead, he ceased his frantic licking. He occasionally licked and groomed his stuffed toy and spent hours laying over the top of it, but his neurotic licking never returned, and we are happy to report that all of his hair grew back. We have also used stuffed toys to help rabbits overcome separation anxiety which could occur if your bunny loses a hutch mate. They are also used as comfortable "beds" for bunnies with old age fusing of discs in the lower back.